The 52 Super Series will welcome a new owner and his brand new build TP52 to the fleet in 2014. Botin Partners, designers of the 52 Super Series champion boat Azzurra, have confirmed today they have been commissioned to design a new TP52 for renowned Brazilian owner Eduardo de Souza Ramos. The new boat, which will be a development of the successful Emirates Team New Zealand, Quantum Racing and Azzurra, is expected to make her debut at Palma Vela, Mallorca next Easter and compete in the remainder of the 2014 52 Super Series and other key European regattas. Mr de Souza Ramos has a long history in international yacht racing, most recently campaigning in the Soto 40 class. He previously commissioned and raced a successful IMS 46 design from Botin Partners (previously Botin/Carkeek). “We are expecting this to be a very good, accomplished team. They know what they are about but they anticipate spending some of the first year learning the boat and the class. The owner is very enthusiastic about the 52 Super Series and the future of the class. He has been watching from the sidelines for many months and sees a circuit on which owners are having fun and the regattas are well organised and the class is well managed,” said Adolfo Carrau, a partner at Botin Partners. 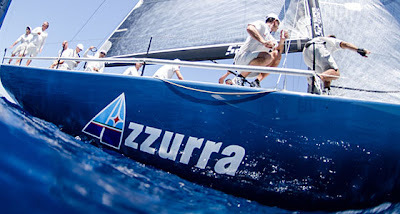 The new TP52, Phoenix, will follow a correspondingly similar design and build schedule to that of the current 52 Super Series champion Azzurra. It is to be built at King Marine in Valencia. The sails, rig and deck hardware package is currently under review. Botin Partners signed their agreement on Monday. “We have two months now to work on the hull and appendages and thereafter the deck. The TP52 Class facilitates new boats for 2014 to be designed already to the key parameters of the 2015 TP52 Rule. In 2014 the new boat will race with some additional corrector weights to bring her to par with the existing boats. Then for 2015 all existing boats will speed up. We see no problems with the transitions.” Carrau added.